For every story or article touting the benefits of vaping, there are an equal number raising concerns about the risks of vaping, especially for teens and young adults. This guide is intended to help you understand what vaping is, its appeal to youth and what research has to say about both the risks and unknowns, due to the lack of long-term vaping studies. We’ve identified some signs to look for and what to do if you are concerned that your child may try or actually is vaping. 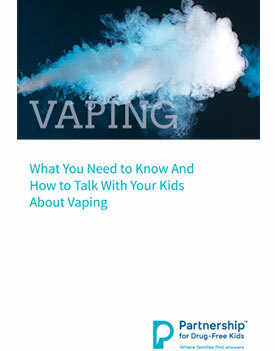 Lastly, we offer some advice on what to say when talking with your child about vaping.